Groupe Doo Wop originaire de Brooklyn (New York), les Mystics étaient composés de Phil Cracolici, Albee Cracolici, George Galfo, Bob Ferrante et Al Contrera. Ils ont débuté sous le nom de Overons. Formed in Brooklyn, NY, in the late '50s, this white doo wop group, consisting of Al Contrera, Al Cracolici, Phil Cracolici, George Galfo, and Bob Ferrante, scored their one and only major national hit in 1959 with the Doc Pomus/Mort Shuman-authored "Hushabye." The beauty of that one hit song, however, coupled with the quality of their subsequent work -- even though none of it ever reached a wide audience -- left an impression among doo wop enthusiasts that lingered for decades, leading to a comeback in the early '80s. 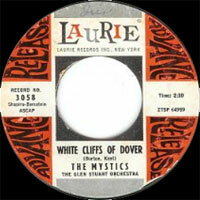 The Mystics' story is practically an exemplar of the best doo wop groups, in terms of longevity and recognition in the wake of momentary (but significant) chart success. The group had its origins in the Bensonhurst section of Brooklyn, a white ethnic outer borough enclave of New York City, which also spawned such Vocals groups as the Passions, the Four-Evers, and the Classics. The group originated as the Overons, a quintet that included Al Cracolici (born April 29, 1936, baritone), Joe Stroble (lead), George Galfo (born 1940, second tenor), and Bob Ferrante (born 1936, first tenor). Their original bass left the group in 1956, and Al Contrera (born January 8, 1940) was brought in to replace him. The new lineup worked, and when Joe Stroble left sometime later, Phil Cracolici (born September 17, 1937) joined as lead singer. 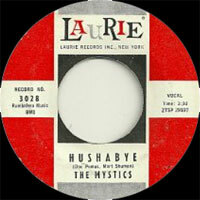 In 1958, they began looking for a new name and picked "The Mystics" after a search of the dictionary. Fate took a hand soon after when an engineer who heard their attempts at a demo record at a local studio hooked them up with manager Jim Gribble, who also represented the Passions. He signed them up immediately upon hearing their clean, radiant sound, and introduced them to Bob and Gene Schwartz, who had a label called Laurie Records, which had already been having success with white Vocals groups from the New York area. Within two months they had a contract, but that was where the Mystics' fortunes changed. Bob and Gene Schwartz weren't entirely happy with the group's first attempt at a record, "Adam and Eve," a very pretty but perhaps slightly flat (in the hook department) romantic ballad. The label decided to delay their debut until they had a song that the Schwartzes considered strong enough. Finally, Gribble took matters into his own hands by presenting the group and its sound to the songwriting team of Doc Pomus and Mort Shuman, and they were inspired to write "A Teenager in Love." The problem was that the record company thought that song was better suited to the talents of another act they had under contract, the Bronx-based Dion & the Belmonts. This wasn't the last time that a song or idea for a recording would be taken out of their hands and given to their Bronx labelmates. The Mystics still didn't have a song to debut with, and in exasperation, it was suggested by Gene Schwartz that Pomus and Shuman try and come up with something similar to a then-current chart hit by the Elegants, entitled "Little Star," based on a child's nursery rhyme. The result was "Hushabye," a romantic ballad that utilized a lullaby in much the same way as "Little Star." "Hushabye" was released in May of 1959 and spent nine weeks of that spring and summer on the charts, rising to number 20. It is one of those "perfect" records, exemplifying a musical genre -- the soaring, radiant harmonies were astonishing in their purity, which was matched by the innocence of the song itself; the gentle support of Bucky Pizzarelli's and Al Caiolla's clean, crisp guitars, and Panama Francis' understated drumming meshed with the singing in ways that simply couldn't be improved. The song was later covered by such harmony-oriented groups as Jay & the Americans and the Beach Boys, and has become a rock & roll standard, but the original has never been equaled. The group attempted a follow-up in the fall of 1959 with "Don't Take the Stars," a livelier, even more ambitious number showing off gorgeous multi-layered harmonies and resplendent in an achingly catchy melody, but somehow the song missed, scraping the lower reaches of the Billboard charts at number 98 for two weeks before disappearing. 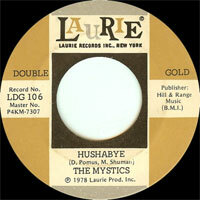 By that time, the group's manager and record label were bringing in other talents to augment the Mystics' sound. Another single released early in 1960, the traditional "All Through the Night" (with a young Paul Simon as second tenor), failed to find a place on the charts at all, and their next single, "The White Cliffs of Dover," featuring falsetto singing by Jay Traynor, later the original Jay of Jay & the Americans, was another non-chart record. There were other disappointments for the group, mostly involving decisions by the record company. They cut a version of "Over the Rainbow" that so impressed Gene Schwartz that he wanted the Mystics to do an entire album of '30s and '40s standards. The group recorded "Paper Moon" and "Red Red Robin" (which is lost), and then suddenly the idea seemed to be so good that the proposed album was given to Dion to record as Wish Upon a Star. None of this bothered the Mystics too much, for their ambitions were satisfied by merely being able to sing before appreciative audiences, and they were getting to do that, regardless of the fate of their recordings. Additionally, although their records weren't charting nationally, the group remained popular in New York. They did manage to take a little more control of their recordings, in the sense that from 1960 onward, they did most of the arrangements on their records themselves. 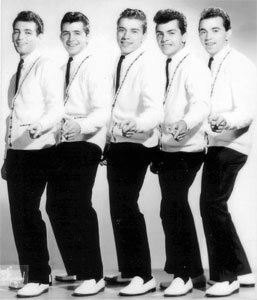 Their lineup changed somewhat over the early '60s as Phil Cracolici left to pursue a solo career, and he was replaced on various recordings by Ralph Lizano (who also wrote "Darling I Know Now"), Eddie Shotz, and a young Paul Simon, who was then trying to get a serious foothold in the music world. In between the demo recordings he was making to keep a hand in the business, during the years between his brief teenage success with Art Garfunkel as Tom & Jerry and their later achievements as Simon & Garfunkel, he was brought in to sing tenor and occasional lead with the Mystics. The group's Laurie contract ended in the early '60s, but they continued to perform locally in Brooklyn and remained viable until the later part of the 1960s. They broke up for a time until the growing nostalgia boom of the early '70s resulted in new demands for the group and their performances -- Phil Cracolici, Al Cracolici, and Al Contrera continued the name with new members, and in 1981, they cut an album for Ambient Sound that was both commercially successful and critically well received. An appearance on the PBS series Soundstage, in an installment devoted to doo wop music during 1982, allowed them to reach a new audience, and -- much like the Cadillacs -- the Mystics have long since transcended anything resembling the designation of one-hit wonders as a major force in rock & roll groups. 04/1959 SP LAURIE 3028 (US) . 09/1959 SP LAURIE 3038 (US) . 02/1960 SP LAURIE 3047 (US) . 06/1960 SP LAURIE 3058 (US) . 03/1961 SP LAURIE 3086 (US) . 04/1982 SP Ambient Sound 02871 (US) .